Parasites appear frequently in biology-inspired fiction from ancient times onwards, with a flowering in the nineteenth century. These include intentionally disgusting alien monsters in science fiction films, often with analogues in nature. Authors and scriptwriters have to some extent exploited parasite biology: lifestyles including parasitoid, behaviour-altering parasite, brood parasite, parasitic castrator, and many forms of vampire are found in books and films. Some fictional parasites, like Count Dracula and Alien's Xenomorphs, have become well known in their own right. Parasitism in nature is a biological relationship in which one species lives on or in another, causing it harm. In evolutionary biology, parasitism is a relationship between species, where one organism, the parasite, lives on or in another organism, the host, causing it some harm, and is adapted structurally to this way of life. The entomologist E. O. Wilson has characterised parasites as "predators that eat prey in units of less than one". According to the immunologist John Playfair, the term 'parasite' is distinctly derogatory in common usage, where a parasite is "a sponger, a lazy profiteer, a drain on society". The idea is however much older. In ancient Rome, the parasitus was an accepted role in Roman society, in which a person could live off the hospitality of others, in return for "flattery, simple services, and a willingness to endure humiliation". Parasitism featured repeatedly as a literary motif in the nineteenth century, though the mechanisms, biological or otherwise, are not always described in detail. For example, the eponymous Beetle in The Beetle by Richard Marsh, 1897, is parasitic and symbolically castrates the human protagonist. Bram Stoker's 1897 Dracula starts out as an apparently human host, welcoming guests to his home, before revealing his parasitic vampire nature. Conan Doyle's Parasite, in his 1894 book The Parasite, makes use of a form of mind control similar to the mesmerism of the Victorian era; it works on some hosts but not others. Parasites, represented as extraterrestrial aliens or unnatural beings, are seen in science fiction as distasteful, in contrast to (mutualistic) symbiosis, and sometimes horrible. Practical uses can be made of them, but humans who do so may be destroyed by them. For example, Mira Grant's 2013 novel Parasite envisages a world where people's immune systems are maintained by genetically engineered tapeworms. They form readily understood characters, since, as Gary Westfahl explains, parasites need to exploit their hosts to survive and reproduce. The social anthropologist Marika Moisseeff argues that Hollywood science fiction favours insects as villain characters because of their parasitism and their swarming behaviour. Such films, she continues, depict the war of culture and nature as "an unending combat between humanity and insect-like extraterrestrial species that tend to parasitize human beings in order to reproduce." Among the many types of fictional parasite are the mitochondria of Parasite Eve; these are energy-generating organelles in animal cells, imagined as parasitic. The range of accounts of fictional parasites and the media used to describe them have greatly increased since the nineteenth century, spanning among other things literary novels, science fiction novels and films, horror films, and video games. The table illustrates the variety of themes and approaches that have become possible. Kyle Munkittrick, on the Discover magazine website, writes that the great majority of aliens, far from being as strange as possible, are humanoid. Ben Guarino, in The Washington Post, observes that despite all the "cinematic aliens' gravid grotesquerie", earthly parasites have more horrible ways of life. Guarino cites parasitic wasps that lay their eggs inside living caterpillars, inspiring A. E. Van Vogt's 1939 story "Discord in Scarlet", Robert Heinlein's 1951 novel The Puppet Masters, and Ridley Scott's 1979 film Alien. The eponymous Alien has a "dramatic" life-cycle. Giant eggs hatch into face-huggers that grasp the host's mouth, forcing him to swallow an embryo. It rapidly grows in his intestines, soon afterwards erupting from his chest and growing into a gigantic predatory animal resembling an insect. Guarino cites the parasitologist Michael J. Smout as saying that the "massive changes" are feasible, giving the example of flatworms that transform from an egg to a tadpole-like form to an infective worm. The biologist Claude dePamphilis agrees, too, that parasites can acquire genes from their hosts, giving as example a broomrape plant that had taken up genes from its host on 52 occasions, having thoroughly overcome the host plant's defences. They suggest further themes for future science fiction films, including emerald jewel wasps that turn cockroaches into subservient puppets, able to crawl but unable to act independently; or the barnacle-like crustaceans that castrate their crab hosts, or grow into their brains, altering their behaviour to care for the young barnacles. All the same, a 2013 poll of scientists and engineers by Popular Mechanics magazine revealed that the parasite-based science fiction films The War of the Worlds (Byron Haskin, 1953) and Alien were among their top ten favourites. Several types of parasite, corresponding more or less accurately to some of those known in biology, are found in literature. These include haematophagic parasites (fictional vampires), parasitoids, behaviour-altering parasites, brood parasites, parasitic castrators, and trophically transmitted parasites, as detailed below. In ancient times, myths of blood-drinking demons were widespread, including Lilith who feasted on the blood of babies. Fictional vampires—haematophagic parasites—began in the modern era with Count Dracula, the title character of Bram Stoker's 1897 gothic horror novel Dracula, and have since appeared in many books and films ranging from horror to science fiction. Along with the shift in genres went a diversification of life-forms and life-cycles, including blood-drinking plants like the "strange orchid" in The Thing from Another World, aliens like H. G. Wells's Martians in The War of the Worlds, "cyber-vamps" like "The Stainless Steel Leech" and "Marid and the Trail of Blood", and psychic bloodsuckers, as in Arthur Conan Doyle's The Parasite and Robert Wiene's 1920 film The Cabinet of Dr. Caligari. The Xenomorph in Alien is a parasitoid, inevitably fatal to its human host. It has a life-cycle stage that grows inside the person's body; when mature, the predatory adult Xenomorph bursts out, killing the host. This behaviour was inspired by parasitoid wasps which have just such a life-cycle. The molecular biologist Alex Sercel compares Xenomorph biology to that of parasitoid wasps and nematomorph worms, arguing that there is a close match. Sercel notes that the way the Xenomorph grasps a human's face to implant its embryo is comparable to the way a parasitoid wasp lays its eggs in a living host. He compares the Xenomorph life cycle to that of the nematomorph Paragordius tricuspidatus, which grows to fill its host's body cavity before bursting out and killing it. The marine biologist Alistair Dove writes that there are multiple parallels between Xenomorphs and parasitoids, though there are in his view more disturbing life cycles in real biology. He identifies parallels include the placing of an embryo in the host; its growth in the host; the resulting death of the host; and alternating generations, as in the Digenea (trematodes). 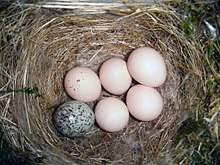 Brood parasites lay their eggs in other birds' nests for them to raise, inspiring the science fiction novel The Midwich Cuckoos. Mind-controlling parasites feature in twentieth century science fiction. In Robert A. Heinlein's 1951 The Puppet Masters, slug-like parasites from outer space arrive on Earth, fasten to people's backs and seize control of their nervous systems, making their hosts the eponymous puppets. In Star Trek, the Ceti eel tunnels into the ear of its human host until it reaches the brain. This is a behaviour-altering parasite analogous to Toxoplasma gondii, which causes infected mice to become unafraid of cats; that makes them easy to catch, and the parasite then infects the cat, its definitive host, where it can reproduce sexually. The Goa'uld in Stargate SG-1 enters through the host's neck and coils around the host's spine, assuming control. The Slug/Squid alien in The Hidden similarly enters via the host's mouth before taking over its body. Sacculina, a parasitic castrator (highlighted), inspired Philip Fracassi's novella of that name. Brood parasitism is not a common theme in fiction. An early example was John Wyndham's 1957 novel The Midwich Cuckoos, which sees the women of an English village give birth to and then bring up a group of alien children. The aliens are telepathic, and intend to take over the world. In nature, brood parasitism occurs in birds such as the European cuckoo, which lay their eggs in the nests of their hosts. The young cuckoos hatch quickly and eject the host's eggs or chicks; the host parents then feed the young cuckoos as if they were their own offspring, until they fledge. As a plot device, this allows aliens and humans to interact closely. A somewhat similar approach is taken in Octavia E. Butler's 1987–1989 Lilith's Brood, but the offspring born to the human mother there is an alien-human hybrid rather than simply an alien. Parasitic castration is found in nature in greatly reduced parasites that feed on the gonads of their crab hosts, making use of the energy that would have gone into reproduction. It is seen in fiction in Philip Fracassi's 2017 horror novella Sacculina, named for a genus of barnacle-like crustaceans with this lifestyle. It tells the tale of a chartered fishing boat, far from home, that is overrun by parasites from the deep. The horror publishing house Gehenna and Hinnom state that "such a vile and frightening name fits perfectly as the title of this novella." The genetically engineered tapeworm in Mira Grant's novel Parasite, and the talking tapeworm in Irvine Welsh's novel Filth, are fictional versions of conventional intestinal parasites. Tapeworms have complex life-cycles, often involving two or more hosts of different species, and are transmitted as the eggs are passed in faeces and eaten by another host. The unattractive lifecycle allows the novelists to exploit their readers' emotional reactions to the parasites. The parasite in Welsh's novel has been described as a "kind of sinister but strangely comic element". ^ a b "Parasitism and Symbiosis". The Encyclopedia of Science Fiction. 10 January 2016. ^ a b c d e f g h i Guarino, Ben (19 May 2017). "Disgusting 'Alien' movie monster not as horrible as real things in nature". The Washington Post. ^ a b Glassy, Mark C. (2005). The Biology of Science Fiction Cinema. McFarland. pp. 186 ff. ISBN 978-1-4766-0822-8. ^ a b Moisseeff, Marika (23 January 2014). "Aliens as an Invasive Reproductive Power in Science Fiction". HAL Archives-Ouvertes. ^ a b Williams, Robyn; Field, Scott (27 September 1997). "Behaviour, Evolutionary Games and .... Aliens". Australian Broadcasting Corporation. Retrieved 30 November 2017. ^ Poulin, Robert (2007). Evolutionary Ecology of Parasites. Princeton University Press. pp. 4–5. ISBN 978-0-691-12085-0. ^ Wilson, Edward O. (2014). The Meaning of Human Existence. W. W. Norton & Company. p. 112. ISBN 978-0-87140-480-0. Parasites, in a phrase, are predators that eat prey in units of less than one. Tolerable parasites are those that have evolved to ensure their own survival and reproduction but at the same time with minimum pain and cost to the host. ^ Playfair, John (2007). Living with Germs: In health and disease. Oxford University Press. p. 19. ISBN 978-0-19-157934-9. Playfair is comparing the popular usage to a biologist's view of parasitism, which he calls (heading the same page) "an ancient and respectable view of life". ^ Damon, Cynthia (1997). "5". The Mask of the Parasite: A Pathology of Roman Patronage. University of Michigan Press. p. 148. ISBN 978-0-472-10760-5. A satirist seeking to portray client misery naturally focuses on the relationship with the greatest dependency, that in which a client gets his food from his patron, and for this the prefabricated persona of the parasite proved itself extremely useful. ^ a b c Jajszczok, Justyna (2017). The Parasite and Parasitism in Victorian Science and Literature (PDF). University of Silesia (dissertation). Retrieved 10 June 2018. ^ a b Hutchison, Sharla; Brown, Rebecca A. (2015). Monsters and Monstrosity from the Fin de Siècle to the Millennium: New Essays. McFarland. pp. 2–12. ISBN 978-1-4766-2271-2. ^ a b c d e f g Westfahl, Gary (2005). 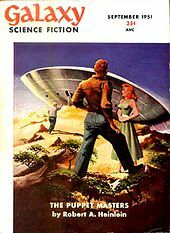 The Greenwood Encyclopedia of Science Fiction and Fantasy: Themes, Works, and Wonders. Greenwood Publishing Group. pp. 586–588. ISBN 978-0-313-32952-4. ^ a b Valentine, Genevieve (30 October 2013). "Medical Magic Leads To Terror In 'Parasite'". National Public Radio. Retrieved 15 June 2018. ^ a b Loguidice, Bill; Matt Barton (2014). Vintage Game Consoles: An Inside Look at Apple, Atari, Commodore, Nintendo, and the Greatest Gaming Platforms of All Time. CRC Press. p. 191. ISBN 978-1-135-00651-8. ^ Tate, Karl (24 May 2012). "Invasion of the Alien Space Parasites". LiveScience. Retrieved 16 June 2018. ^ Hughes, Rob (3 April 2014). "SA-Xcellent". IGN. Archived from the original on August 17, 2014. Retrieved June 13, 2014. ^ Timmis, Jeremy N.; Ayliffe, Michael A.; Huang, Chun Y.; Martin, William (2004). "Endosymbiotic gene transfer: organelle genomes forge eukaryotic chromosomes". Nature Reviews Genetics. 5 (2): 123–135. doi:10.1038/nrg1271. PMID 14735123. ^ Taanman, Jan-Willem (1999). "The mitochondrial genome: structure, transcription, translation and replication". Biochimica et Biophysica Acta (BBA) - Bioenergetics. 1410 (2): 103–123. doi:10.1016/S0005-2728(98)00161-3. ^ Lynch, Lisa (5 September 2001). "Tech Flesh 4: Mitochodrial Combustion at Club Parasite | An Interview With Hideaki Sena". Ctheory journal. p. tf011. Retrieved 16 June 2018. ^ a b Ford, Matt (11 September 2013). "Irvine Welsh: The 'unfilmable' Filth finally makes it to the big screen". The Independent. Retrieved 17 June 2018. ^ Munkittrick, Kyle (12 July 2011). "The Only Sci-Fi Explanation of Hominid Aliens that Makes Scientific Sense". Discover Magazine. Retrieved 16 June 2018. ^ Pappalardo, Joe (31 December 2013). "The 10 Best Sci-Fi Movies—As Chosen By Scientists". Popular Mechanics. Retrieved 16 June 2018. ^ a b c d Pappas, Stephanie (29 May 2012). "5 Alien Parasites and Their Real-World Counterparts". LiveScience. ^ Hurwitz, Siegmund (1992) . Gela Jacobson (trans. ), ed. Lilith, the First Eve: Historical and Psychological Aspects of the Dark Feminine. Daimon Verlag. ISBN 978-3-85630-522-2. ^ Meehan, Paul (2014). 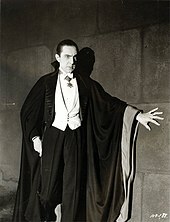 The Vampire in Science Fiction Film and Literature. McFarland. pp. 209–. ISBN 978-1-4766-1654-4. ^ Budanovic, Nikola (10 March 2018). "An explanation emerges for how the 12th century Paisley Abbey in Scotland could feature a gargoyle out of the film "Alien"". The Vintage News. Retrieved 17 June 2018. ^ "'Alien' gargoyle on ancient Paisley Abbey". British Broadcasting Corporation. 23 August 2013. Retrieved 17 June 2018. ^ a b c Sercel, Alex (19 May 2017). "Parasitism in the Alien Movies". Signal to Noise Magazine. ^ "The Making of Alien's Chestburster Scene". The Guardian. 13 October 2009. Archived from the original on 30 April 2010. Retrieved 29 May 2010. ^ a b Dove, Alistair (9 May 2011). "This is clearly an important species we're dealing with". Deep Sea News. ^ a b Elrod, P. N.; Conrad, Roxanne; Terry, Fran (2015). Help! The aliens have landed and taken over my brain. Stepping Through The Stargate: Science, Archaeology And The Military In Stargate Sg1. BenBella Books. pp. 59–72. ISBN 978-1-941631-51-5. ^ Adams, Stephen (4 January 2009). "Cuckoo chicks dupe foster parents from the moment they hatch". The Daily Telegraph. Retrieved 17 June 2018. ^ Fromme, Alison (January 2018). "This Baby Bird Is a Mother's Nightmare". National Geographic. Retrieved 17 June 2018. ^ Beshero-Bondar, Elisha (2 November 2017). "Science Fiction and Lilith's Brood". Slideshare.net. Retrieved 26 July 2018. ^ Holden, Rebecca J. (1998). "The High Costs of Cyborg Survival: Octavia Butler's Xenogenesis Trilogy". Foundation – The International Review of Science Fiction. 72 (Spring 1998): 49–57. ^ Lafferty, Kevin D.; Armand M. Kuris (2009). "Parasitic castration: the evolution and ecology of body snatchers". Trends in Parasitology. 25 (12): 564–572. doi:10.1016/j.pt.2009.09.003. PMID 19800291. ^ Poulin, Robert (2007). Evolutionary Ecology of Parasites (2nd ed.). Springer. pp. 106, 111–114. ISBN 978-0-691-12084-3. ^ "Sacculina by Philip Fracassi: A Gehenna Post Review". Gehenna and Hinnom Publishers. Retrieved 16 June 2018. ^ "Parasites – Taeniasis". Centers for Disease Control and Prevention. 10 January 2013. Retrieved 17 June 2018. This page was last edited on 4 December 2018, at 08:06 (UTC).